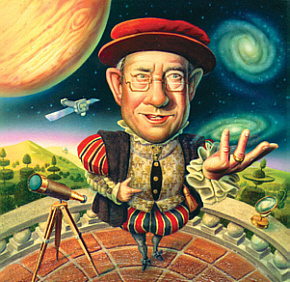 The father of X-ray astronomy and recent recipient of the Nobel Prize, Riccardo Giacconi is, by turns, outspoken, intimidating, fiery... and brilliant. Back in October 1992, in Riccardo Giacconi's last few months as director of the Space Telescope Science Institute, he was running his usual incendiary meeting. Scientists' meetings are generally courteous: facial and oral expressions kept neutral, speakers heard out to the end. When this meeting began, to be sure, the astronomers were a little formal. But by the time Giacconi interrupted the first speaker for the third time -- "Come on, we've already gone through this, we've done this" -- everyone had loosened up. "Riccardo," interrupted Ethan Schreier, the institute's associate director, "all he's saying is -- " and the speaker interrupted Schreier to resume what he'd been saying. Giacconi meanwhile sighed theatrically, blew out his cheeks, rubbed his forehead, bit his nails, tapped his pen, and said, "OK, OK, OK I got it, I agree. OK? Next." The meeting, held in Giacconi's office, had been called to discuss the next round of observations on the Hubble Space Telescope. Following that round, called cycle 3, the notoriously flawed primary mirror of the telescope was to be repaired by technicians on the notoriously late space shuttle. So with no firm date for the fix, the scientists at the meeting had to decide how many proposals to accept for cycle 3: a year's worth? four months? eight? Giacconi was there not to decide the matter himself but to ensure that, whatever decision was reached, everybody agreed. He sat between Schreier and Peter Stockman, the institute's deputy director, at a long, clean, white table that also served as a desk. The rest of the 15 or so astronomers gathered had responsibility for cycle 3, that is, reviewing the proposals, scheduling winners, and planning a second-by-second timetable. These astronomers spoke vividly, authoritatively, and for about 40 seconds each, because 40 seconds is about as long as Giacconi can keep his mouth shut and sit still. The argument moved to the implications for cycle 4. "It's not on my watch, Pete," said Giacconi, meaning that by then he would have left the institute. "I propose we do not discuss cycle 4." "You don't have to discuss cycle 4," answered Schreier. "We have to." Giacconi turned to Stockman: "I think you should run this meeting. I've lost interest." Stockman rammed his chair into Giacconi's and said, "Then move over." Giacconi walked to the back of the room for a coffee refill, and the astronomers continued talking out the problem: Accept too few proposals and the telescope would go unused; accept too many and the astronomical community would write unused proposals and get annoyed. From the back of the room, Giacconi nailed an advocate of the latter: "You're going to tell the community how to feel? Oh." He lowered his eyelids, his mouth in an O: "Oh." "You back in control here?" snapped Stockman. By now, four submeetings were going on. "If you want to discuss this, meet somewhere else, not in my office," Giacconi said. No one budged. He walked back to his desk and yelled, "Out, out, out." The astronomers, taking their own sweet time about it, finished arguing and left the room. They had reached a true consensus -- they would accept eight months' worth of research proposals -- and no one went away mad. The meeting, however, had not been courteous. Three months later, Giacconi went to Munich to become director general of the European Southern Observatory (ESO). He had come to Baltimore and the Space Telescope Science Institute in 1981, staying 12 years, getting Hubble launched and its repair designed. At ESO, he stayed for six and a half years, got the world's largest ground-based telescope up and running, then in 1998 left for Associated Universities, Inc. (AUI) in Washington, D.C., a consortium of universities that runs astronomy in the long, cool wavelengths of millimeter and radio waves. For the last three years, he's been president of AUI, which is just setting up the world's largest millimeter-wavelength telescope. Meanwhile, in October 2002, he won a Nobel Prize for originating X-ray astronomy, work done before he ever got to Baltimore. It's an energetic resume; it's entirely in character. Giacconi's looks are nothing remarkable: middle height, substantial body, short gray hair, sharp eyes behind thick glasses. His talk, however, is almost literally stunning. Interviews with him are unusual because the interviewer doesn't get to ask questions. Giacconi reasons thus: At an opera, do the singers wait politely while the audience requests La Traviata? With Giacconi, the interviewer walks into the room, and he heads off in all directions with no punctuation whatever. His hand gestures begin at the shoulder. He audibly italicizes about every 10th word. His sentences, when he bothers to organize and finish them, have the rhythms of an aria: "The guy is bald and getting balder and what few hairs he has are white." He is excessively direct: 1980s space astronomy, he says, "was dominated by the pilots and the military to some extent, and the tin benders among the industrialists, the airplane industry, they like to make cans. So the tin benders want to build big cans, and they want to provide one can for the shuttle, the same can they want to provide for the space station, another one t-w-w-w-ice as big, you ask, 'What's in there?' They say, 'Aaiii, that's not terribly important.' You understand? It's the can that's interesting." The interviewer exits breathless, hair sticking straight up. Giacconi is intense -- "Nothing is going to happen unless you work with your life's blood" -- and not at all patient. His choice of jobs has included huge, complex, state-of-the-art, staggeringly expensive instruments, and unnatural cooperation between agencies, governments, scientists, and international consortia. Back in 1992, when he left the Space Telescope Science Institute for ESO, he said, "I'm not a quitter, and I'm not leaving this country in a huff and a puff, but these last 10 years have been a downer. I show it to you as a struggle." In October, Riccardo Giacconi was named co-recipient of the 2002 Nobel Prize in physics for his pioneering work in X-ray astronomy. He and his colleagues are widely credited for revolutionizing astrophysics by using the X-ray region of the spectrum to discover fundamental properties of black holes, neutron stars, galaxy clusters, and quasars. Giacconi joined the Hopkins faculty in physics and astronomy in 1982 (he continues as Hopkins research professor) after coming to Baltimore to direct the Space Telescope Science Institute (1981-93), based at a facility adjacent to the Homewood campus. Riccardo Giacconi was born in Genoa in 1931 and raised in Milan. He came to the United States 46 years ago on a Fulbright fellowship to the University of Indiana to study cosmic rays. He didn't last long in that field: "I got out from cosmic rays [because] I spent two years to collect 80 events. Two years, OK? and accelerators were coming along with thousands, and I said I'm never going into a field like that again." So in 1959 he signed on as a space physicist with a company called American Science and Engineering in Cambridge, Massachusetts. By 1966 he was on the company's board of directors. The next year he became a naturalized U.S. citizen, and in 1973 he returned to academia as a professor at Harvard University. During that time, Giacconi and his research team designed and built the X-ray detectors that started an entirely new astronomical field. "I think it's true," he says, "that in the '60s and '70s I was going as fast as my brain would carry me." Giacconi is now regarded as the father of X-ray astronomy, the study of cosmic gas so hot that it radiates X-rays. Until 40 years ago no one knew whether anything in the universe, other than the sun, emitted X-rays. One problem was the Earth's atmosphere, which filters out radiation in X-ray wavelengths. Another problem was the X-rays themselves. Born in catastrophic astronomical explosions and collisions, they carry enormous amounts of energy and zing right through human bodies and telescope mirrors. In the early 1960s, Giacconi invented a telescope whose mirror was curved and mounted in such a way that X-rays passing into the telescope would hit the mirror obliquely, bounce to another specially shaped mirror, and then come into focus. Put such a telescope on a satellite, and you have fathered X-ray astronomy. In 1962, Giacconi's team launched a rocket equipped with Geiger counter-like instruments and saw, for the first time, X-rays coming from a star. In 1970, the team launched a satellite, called Uhuru, with counters a thousand times more sensitive than those aboard the rocket, and discovered X-ray binary stars. And in 1978 on another satellite, called Einstein, a thousand times more sensitive still, Giacconi's team made an X-ray picture of the sky and discovered, as he says, that the "universe is a place of violence." Stars explode and leave behind bodies spinning thousands of times a second, made only of neutrons; binary stars are ripped apart by each other's monstrous gravitational fields; the same fields tear the gases around black holes literally into atoms. "It was an incredible thing to see," Giacconi says. "It's not like those gently rotating Strauss waltz type of galaxies. Each one of those things says, 'I am not just your ordinary -- I am weird.'" Moreover, washing through the universe is a background of X-radiation whose source was unknown. Was the background a remnant of the Big Bang? Or was it created by all those weird things? That question was to have been answered by Giacconi's next X-ray telescope. But X-ray telescopes, like any other telescopes in space, are always funded and often managed by NASA, and are thus prone to cost overruns, shortsighted decisions, and congressional meddling. According to Giacconi, the idea of an X-ray telescope with a mirror 1.2 meters in diameter was born as early as 1963. When nothing happened, the idea was reborn in 1970, when Giacconi and his colleagues began work on what they called the Large Orbiting X-ray Telescope (LOXT), incorporating the same 1.2-meter mirror. But when NASA's Viking program to land on Mars ran over cost, the agency directed Giacconi and his X-ray astronomers to reduce the mirror to 0.6 meters. They renamed the smaller telescope Einstein. After Einstein flew, the old plans for LOXT were rechristened Advanced X-ray Astrophysics Facility, or AXAF, with a price tag of $250 million. Such an expensive instrument wouldn't fly, says Giacconi, "unless the rest of the community would support you." So "everybody and his mother" started adding on instruments and gadgets, and AXAF grew and grew, getting more and more expensive. "To make it politically feasible," Giacconi explains, "you make it bigger and bigger and bigger, right? And then you may never see it fly. From the science point of view, forget it. It's become a public-works program." By February 1992, AXAF, with the old 1.2-meter mirror but a new billion-dollar cost, was redesigned yet again and the launch date set for the turn of the century. Giacconi got frustrated. By the time AXAF flies, he said in 1992, "I'm going to be 90 years old" -- he hunched over, squinched up his eyes and, with palsied hands, held an imaginary cane. He then resumed his own persona: "It's like a tragedy unfolding, seeing all this idiocy, all the wrong decisions, and you hang on and you hang on and you hang on, aaaah." Giacconi quieted down a bit and elaborated: One reason to build AXAF had been to find the source of the X-ray background. In 1990 a German satellite called ROSAT, which reproduced and refined the technology of Einstein, discovered that 80 percent of the background does, in fact, come from the weird things, specifically from quasars with black holes in their centers. That ROSAT, not AXAF, made the discovery is fine with Giacconi; he was a member of the ROSAT team. He only wished he'd been able to discover it with an early incarnation of AXAF. "And had I done that at the time, a new problem would have come up, a new view of what was there. I mean, we have all made a good living; we have nice offices, but we didn't learn. So the point I'm trying to make," he said, getting louder again, "is that the big deal is not to know how to paint. I mean in [Renaissance] Italy everybody knew how to paint. It was to get the wall. The problem was to get the wall in the church to let you paint." He was shouting now: "You want to paint. You want to leave this thing on the wall that is your mark." And now he was pounding the table: "I wanted to build AXAF." In July 1999, at a cost of $2.8 billion, after missed launches, "de-scoping" (NASA's word), and a rocket explosion, AXAF flew. It had another new name: Chandra. In Chandra's short lifetime, it has already done for the X-ray sky what Hubble has done for the visible. It's found nearby star-sized black holes, distant galaxy-sized black holes sending out jets of X-rays thousands of light-years long, and a wholly unexpected class of midsized black holes. It has seen for the first time heavy metals being born in supernovae. By measuring the amount of hot gas in clusters of galaxies, it has given the latest, most accurate measurement of the universe's missing mass. And Giacconi himself was on the team that made the deepest X-ray images ever, then put the data into a public archive for everyone to use. "People who don't know Riccardo are very intimidated by him," says Schreier. "There may be other ways of doing it, nicer ways, but it's not clear they're more effective." During those 20 years between Einstein and Chandra, while American X-ray astronomy wasn't painting anything, Giacconi got impatient. In 1981 he went "where the work was," meaning to the Space Telescope Science Institute, adjacent to Hopkins' Homewood campus. "It was not exactly where I wanted to be," he said, meaning he'd rather have stayed with X-ray astronomy. "I came to Baltimore [because] I would have gone insane waiting for AXAF." But he overstates a little: He came to Baltimore also because he was interested in institutes, staffed with world-class scientists, as a way of managing big science projects. In 1976 he had proposed that AXAF be run by such an institute. That proposal reads like a blueprint for the Space Telescope Science Institute. 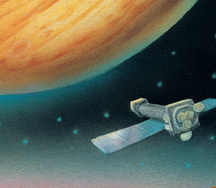 Giacconi, along with the astronomical community, wanted to manage Hubble with a scientific institute that would not be just another branch of NASA. Among astronomers, NASA has a reputation for heading toward the next frontier and neglecting science once it gets there. Giacconi wanted science to be paramount: He thought that if the staff astronomers who manage the telescope's instruments and serve visiting astronomers were also the world's best scientists, they would manage and serve more perceptively and pertinently. If the best scientists make the decisions, then the result should be the best science. Once the astronomical community got its way and the institute was formed, Giacconi said, "If we can show NASA that this is the proper way, maybe they will think about other missions being run the same way." So how to build this institute? "Some people I consider mediocre scientists in the nation, but they produce very good students," he said at the time. "How come these weak fathers produce these great children? I wanted to do that too." One of his strategies for producing independent children was to operate by consensus; Ethan Schreier said that meetings would "go on for hours because Riccardo is not one who likes to just take votes." Giacconi also assigned responsibility at the lowest level possible and encouraged initiative and independent decisions. This last strategy would sound like boilerplate management theory except for the unusual way Giacconi encouraged. "A lot of people here found out that they are left alone to do their jobs," he explained. "It's easier to come to Daddy and say, 'What do you think I should do?' and I say, 'If you don't know, then why are you working here?'" Other overheard encouragements: "Hey, pay attention. Where you been living these days?" "You're always crying. Stop crying." "Is this the same old garbage?" According to one NASA manager, Giacconi's approach to a meeting was to roll a grenade through the door. Giacconi tells another story. On a trip to ESO just before becoming its director, he took along Jim Crocker, a manager at the Space Telescope Science Institute. The ESO astronomers were naturally curious about their new boss; they asked Crocker questions. "So Jim Crocker started saying, 'Think of yourself as an orchestra,'" Giacconi says. "And they said, 'We understand exactly what you're going to say,' because the previous director said, 'You are like the orchestra and I am the director.' And Jim Crocker said, 'You don't understand. Riccardo is the audience. He wants to hear the music.'" Did the institute appreciate its grenade-throwing audience? "People who don't know Riccardo are very intimidated; people who know him have no problem," says Schreier, who has worked with Giacconi for 30 years. "There may be other ways of doing it, nicer ways, but it's not clear they're more effective." In any case, "this experiment," Giacconi said, "this independent institute, worked." To cite one example: NASA had planned to aim Hubble by having astronomers first measure the celestial coordinates of the so-called guide stars nearest the target, then relay those coordinates to the telescope, then lock the telescope onto the guide stars. The institute astronomers countered that such measuring, relaying, and locking would leave idle the telescope's camera and detectors, a waste of valuable resources. The institute's solution was to put together a guide star catalog, a list of the precise positions of 15 million stars, so that all the measuring and relaying could be done in advance. Another, better-known example: When Hubble's mirror turned out to be curved perfectly wrongly, the institute "canvassed the world," Schreier says, and came up with the solution: Plug in other mirrors with the equal and opposite curvature. Hubble has gone on to take pictures whose scientific importance is unique, and whose beauty is startling. In spite of these successes, NASA has remained unconvinced that a scientific institute should oversee the workings of space astronomy. Even recently, as NASA has begun planning the next space telescope, says Schreier, it has not given overall responsibility for the new telescope's science to the Space Telescope Science Institute. Instead, says Giacconi, "the institute has been pushed back. For the next space telescope, I hoped NASA would be the engineering arm and the institute the science arm." But in the years since Giacconi directed the institute, nothing's changed. "Because NASA sees this only as a threatening thing," he said back then. "And why don't they say, 'Wonderful! Great! We're gonna adopt them [the institute] for the greater glory of the nation.' Wouldn't you?" The best analogue to NASA, said Giacconi, is the old Soviet agricultural program: The state owned the tractors and the seeds, the farmers made no decisions, and the people starved. Giacconi got discouraged. "I feel I failed in some way. It's like moving elephants." So Giacconi packed his satchel again -- though he kept a position as research professor in Hopkins' Physics and Astronomy Department -- and accepted the offer from ESO, an international organization that manages European astronomy. ESO was struggling to build the Very Large Telescope, a ground-based one sited in Chile and composed of four interacting 8-meter mirrors, which together are the largest telescope on this earth or above it. Giacconi juggled new technologies, bungling management, rising costs, and international sensitivities, and the Very Large Telescope came in on time and within budget. Like Chandra and Hubble, the Very Large Telescope has presented astronomers with a sharper, fainter, deeper, and far more intriguing sky. By 1999, Giacconi had passed ESO's strict mandatory retirement age and left to direct AUI. Coincidentally, AUI was in the process of planning the latest, biggest, riskiest millimeter telescope, called ALMA. Now, after three years at AUI, with ALMA solidified, "at the age of 71," says Schreier, "Riccardo has started pushing the space station project." NASA's international space station is an orbiting laboratory, staffed by astronauts, and generally held by astronomers to be scientifically worthless. "It's a $20 to $30 billion thing," says Schreier, "and NASA doesn't know what to do with it." Giacconi and Schreier put together another international consortium to convince NASA to form another science institute to figure out experiments for which the space station would be actually useful. "It's up there," Giacconi says. "You can shoot it down or you can use it. A mission the Europeans are actually working on, a 5-meter X-ray telescope, could be assembled up there, launched from there. It could be win-win, NASA does well, science does well." Giacconi paints. Actually, he copies old masters. "I'm not an artist," he says. "I'm just a craftsman: I'm a very good craftsman." And to an unschooled eye his reproductions are faithful and delicate. He says he'd like to do at least one original work, a painting of St. George and the dragon. Giacconi explains: "Everything good in mankind is in St. George. Not really. Historically, he was a fanatic somewhere in Asia Minor. But in the paintings he's Ahab vs. the White Whale, he's Prometheus. I've been trying to be on the side of good and fight the dragon as long as I could. That's what I want to paint." He's quiet for a minute. "I don't know if I can; I'm not an artist." He turns and looks out the window. "Maybe I will do it someday." Does he feel like St. George? "I better find out how he ended," he replies. "I think he may have been crucified." 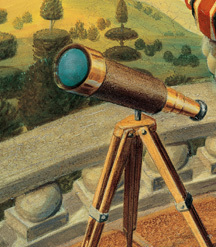 "St. George and the Telescopes" is adapted from "X-Ray Impresario" by Ann Finkbeiner, first appearing in the May/June 1993 issue of The Sciences. At Johns Hopkins, Finkbeiner heads the science writing program within The Writing Seminars. She is working on a book about an elite group of academic physicists that advises the government.